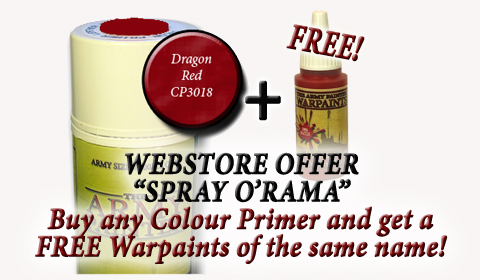 The Army Painter is running a special sale with their colored spray primers. Order a color and get a matching bottle of brush-on for free. All Colour Primers have a 100% matching acrylic Warpaint for covering areas the spray didn't reach or for touching up mistakes. There's also a brush on acrylic "Anti-Shine" Matt Varnish. Currently we have 24 Colour Primer sprays all with a 100% matching Warpaint 18ml pot. Runs until Monday 10th November 2014.